As healthy adults, none of us are allowed to live our lives within the sheltered confines of a therapist’s office. All of us have skills we have to learn and master. We do so to be able to handle the rigid demands of work, school, or relationships. Mastering these skills has helped us become the people we are. 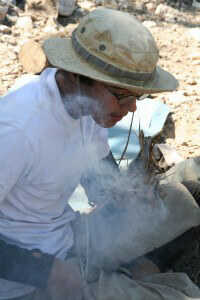 In the first place, at RedCliff, the term “hard skills” refers to specific wilderness survival skills students learn. 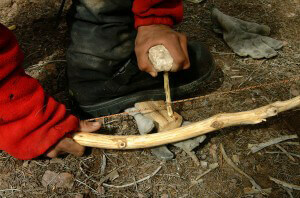 Some of these hard skills include bow/drill fire making and rolling a survival pack. Most wilderness programs rarely include hard skills as part of their curriculum. That’s because it takes a coordinated effort on the part of administrators, clinicians, and field staff to implement this complex system of experiential therapy. Especially relevant, RedCliff’s therapeutic model is not giving office therapy in the wilderness. It is providing wilderness therapy that uses “hard skills” as one piece of a very sophisticated clinical strategy. The goal is not to teach your child how to survive in the wilderness. These experiential activities are a way of measuring a troubled teen’s willingness to put aside “center of the universe” thinking and master the mundane. In fact, the clinical value of hard skills lies in discovering the meaning behind the task—not just doing the task. Helping your child interpret that experience in terms of his own unique struggles and diagnosis requires therapists who understand your child and his issues. RedCliff therapists offer that level of caring and clinical expertise. Finally hard skills provide an assessment tool. It is a tool for how the student is coping with rigid expectations that mirror those he will face in daily life.